In any case, this is a nice refreshing dish that, well, slides down easily, that is great when the weather is not too cold. I cannot guarantee you will love it, but I hope you give it a try if you are adventurous! Basically, follow the recipe for cold soba noodles with dipping sauce. 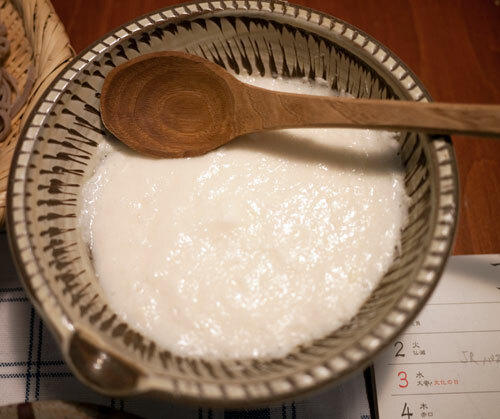 You also need a good bowl of grated nagaimo, or tororo. 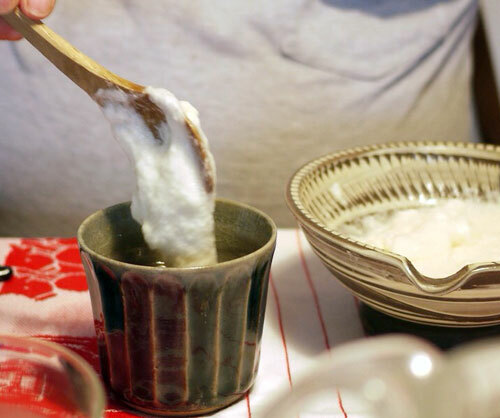 Nagaimo makes some people get itchy if they handle it, though in most cases they can eat it without any ill effects. See how to handle nagaimo in my okonomiyaki instructions. For 3 to 4 people, you'll need about 2 cups of grated nagaimo. 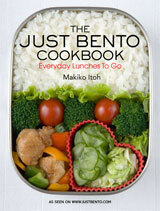 As condiments, you should have some chopped green onion, shredded shiso leaves, perhaps some grated fresh ginger. Lay out the soba noodles on a flat soba serving sieve or seiro (use a colander if you don't have one of these), put out the bowl of tororo and a small plate of condiments. 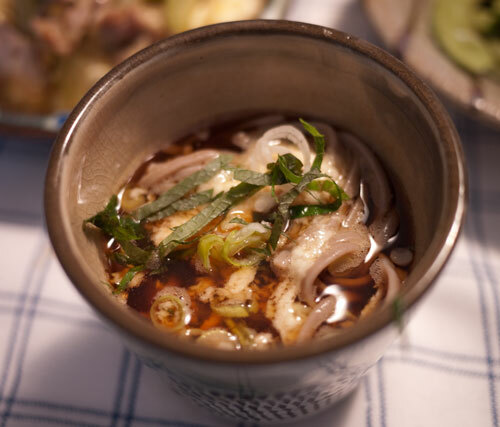 Put some dipping sauce in small bowls or little soba serving containers called sobachoko. Each person puts some soba and tororo in their bowls with condiments. Here's my stepfather serving himself a good dollop of tororo. Yep, it's sliiimy! 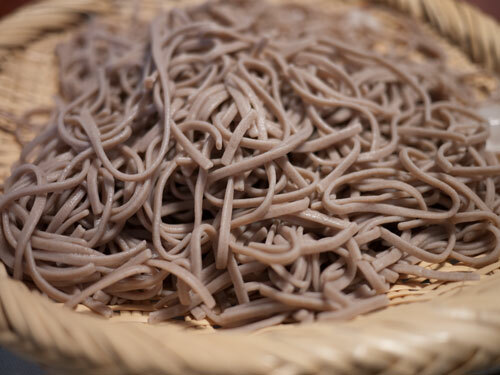 Here's how a serving of tororo soba looks like. Repeat the procedure until you're full. Delicious! Note: if you get a bit itchy around your mouth from the tororo, just rinse it off with plain water. Submitted by maki on 2010-10-25 23:42. One of my favorite dishes! I love it with good juicy umeboshi. Drool! My husband bought a long yamaimo on the slopes of Mount Takao on our first visit there and we brought it back to Tokyo. We peeled it, grated it and had it with soba just as you described. Yum! However, as we had some left over (we only peeled and grated half the root) we grated the rest of it the next morning and mixed it with hot rice, a raw egg and a bit of soy sauce. At first I was a little intimidated by nagaimo and for the first couple of months in Tokyo and didn't attempt to cook with it. When I finally did get some to make okonomiyaki I was surprised by how easy they were to prepare! They grate so easily! Now I'm back in the states and wondering if I can find them again... and wondering what horrors I could concoct if i were to introduce it to western cooking/baking. Nagaimo is pretty easy to find in Asian supermarkets (at least in MD). It's shockingly expensive though. i could have *sworn* that said totoro soba! Yum! I had tororo soba at Soba Koh in NYC on an unseasonably hot September day--so refreshing! I live in San Francisco where it's easy to get nagaimo so I will try this at home. weird, in my country we used to eat the tororo too.. i never ever know someone that deslikes it. but i wanna try the japanese way.. In terms of slime and roots, are nagaimo and yamatoimo interchangeable? I've never really understood quite what the difference is, except that they look slightly different and yamatoimo is way more expensive at the supermarket. Anyway, thanks for the recipe. I'm a slime fan whether it's slung over noodles or tuna or just plain rice. Andrew, from what I can tell they're both names for the same plant (Dioscorea opposita) but perhaps someone with more direct experience could note whether they're separate subtypes or something. Do you have any home-cooked Japanese Fall favorites up your sleeve? I love Fall, I love food, and Japanese is my favorite :). I'd love a few ideas of something I can cook at home to celebrate the season! I love it!! :X today, i watched the drama 'Osen" and it's about tororo with rice :X:X: REally want to try it! I grew up with Tororo and it's an all time favorite, but now I've moved out of my parents and I can't find a Grated Bowl that my Dad uses to make it ANYWHERE! :( I would Love to be able to make this for my family at home and not just have it when we visit my parents. I live in the US and I'm wondering if you know any place I could buy the bowl to make it? I always just called it a tororo bowl so I don't even know where to begin to look for it. :D If I can ever get a hold of a bowl I will enjoy making this recipe! Thank you!